Last nite i was checking up on my newly purchased live rock and i found 2 small crabs.I for sure know that one is not friendly(seen his pic before)and the other look like light pink.I moved both rock in my sump.Now i do i get them out of the rocks? Freshwater dip? Food in a container? Is the fresh water dip will affect the liverock(bacteria/coralline)? 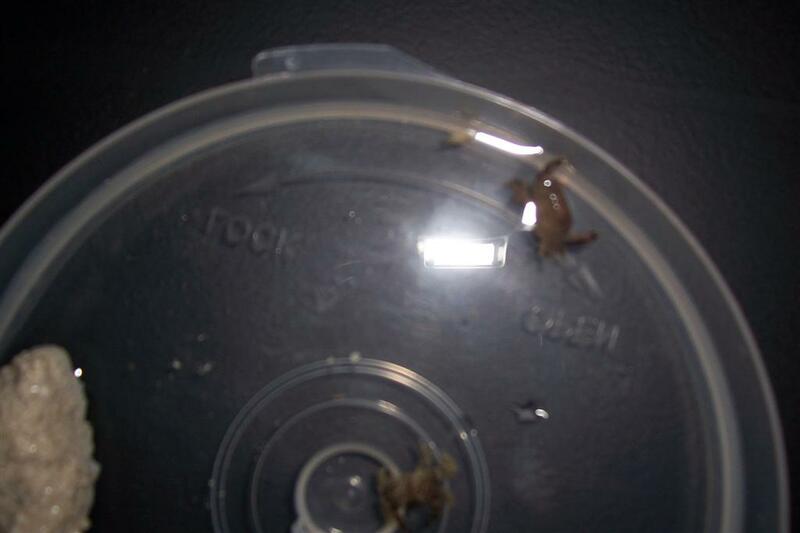 Once i get them out they'll be the new resident of my sump. you could try a super saline dip ( SG 1.035 - 1.040 ) for about a minute, any inverts will come flying out of the rock. then take the rock out and decide what to do with the hitchhikers. I've had success with placing the rock in a sink full of tap water. It only took about 5 minutes for the little bugger to bail out. I'm not sure if the pic will show ok but what's that little white one? I'm gonna do the same "ultra salty" solution to the rest of my LR tomorrow. i can't see them very well ( especially the white one, i didn't even realize it was there till i reread the post :b13: ), your camera doesn't have a macro mode does it?? i'm glad it worked for you, it even works to get bristle worms out.